Just 10 minutes drive from the Lower Mill Estate, Jesse Smith, a family owned butcher that was founded over 200 years ago has recently opened a Farm Shop and Coffee House. Jesse Smith has a great local reputation for quality fresh meat and personal friendly service – they also have a traditional butchers shop in one of Cirencester’s oldest Streets, Black Jack Street. 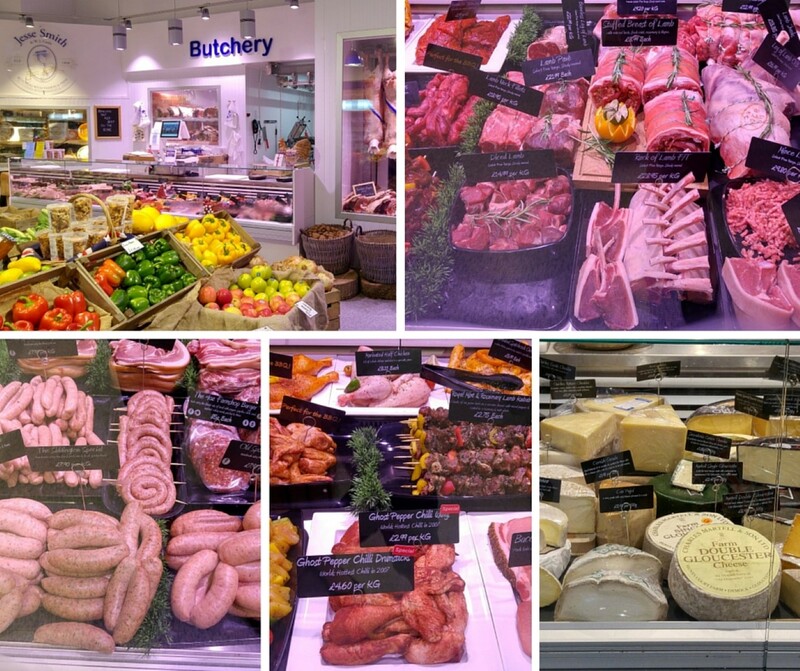 The Farm Shop looks fabulous when you walk in, with fresh fruit and vegetables stacked high, glass fronted meat and cheese counters and shelves of deli products. Jesse Smith’s is an ideal place to call in to stock up for a barbecue, with a wide range of sausages, chicken, lamb and beef kebabs as well as a huge range of cuts of meat the only problem will be deciding what to choose. Much of the meat stocked at Jesse Smith’s is locally sourced, with as much lamb as possible coming from the Cotswolds. The butcher also stock the traditional free range Gloucestershire old spot pork. Locally sourced game is also available. The Hobbs Family have been baking in the Cotswolds since the 1920's and are now bringing up their sixth generation of aspiring bakers. A visit to the fascinating town of Tetbury brings the opportunity to visit one of their shops. As well as selling a wonderful range of bread (including sourdough made from their 60 year old sourdough starter) you will be tempted by the amazing display of cakes, buns and patisserie. Hiker's Bars, pictured here are packed full of juicy fruit and a great way of keeping children (and adults!) going until lunchtime. What's your favourite Christmas Cheese? Christmas is a wonderful time of year to try a new selection of cheeses. A visit to The Cotswold Cheese Company who have shops in Moreton-in Marsh, Stow-on-the-Wold and Burford would be a perfect pre-Christmas outing. At the centre of each shop is a fabulous cheese counter stocking more than 80 different farmhouse varieties, including a number of excellent local cheeses. Pictured is their Truffle Brie which is proving very popular. It is infused with creme fraiche, truffle oil and fresh black truffles: it's the ultimate Christmas indulgence. Whether you prefer a slice of tangy cheddar, a wedge of stilton or something milder and creamier, The Cotswold Cheese Company is bound to have something to suit you. More details http://www.cotswoldcheese.com/ Photo via their facebook page. The closest pub to the Lower Mill Estate is the Bakers Arms in Somerford Keynes. It is often visited by guests who enjoy the atmosphere, the good food and the range of beers and real ales available. They have just been shortlisted in the Standard's Pub of the Year competition. The landlord of the pub spent time in South East Asia last year and this has influenced the menu at the Bakers Arms. Tuesday nights are usually curry nights. The pub's chef also specialises in cooking fish dishes so there is plenty for every palate. Guests staying on the Lower Mill Estate in the Cotswold Water Park can now visit Ballihoo, the new restaurant exclusively for the use of those staying on the estate. Ballihoo offers a comprehensive breakfast, lunch, dinner, drinks and take away menu….or you can just pop in for a coffee and slice of cake! Do have a look at Ballihoo's website for menus and pricing. If you do plan to visit Ballihoo Restuarant, it's well worth booking a table in advance as it can get busy at weekends. "The shed is a rather special place. The food is very good and reasonably priced for a gastro pub in the Cotswolds. The ambience is upbeat, positive and youthful, in overall terms, a great place to spend an evening." The pub has its own 2 acre garden which includes an extensive vegetable patch and herb garden which are used on the pub's menu. The menu reflect reflects the changing seasons – at the moment one of the main courses being served is asparagus and spinach risotto, while for desert you can choose gooseberry fool, cinnamon marshmallow and brandy snaps. The Potting Shed Pub is a 12 minute drive from the Lower Mill Estate. Made by Bob is part deli, part restaurant and can be found in the Corn Hall in Cirencester. It aims to provide a relaxed meeting place where people can enjoy great food and drink throughout the day. Opening at 7:30am during the week, you can stop by for coffee and croissants or something more substantial. The menu at Made By Bob changes daily which reflects their use of seasonal local produce. Everything is made on site in a huge open kitchen which dominates the room. You can grab a high stool and watch the chefs at work whilst enjoying coffee or lunch. Made By Bob has a real buzz around it and serves a menu that would sit comfortably in a London restaurant. On the last Friday of the month they have just started opening for themed set course cuisine. In February they had a Thai evening. In March the focus will be on Catalonia for a night in Spain, and in April the focus turns to Italy. Pictured is a dish of fillet of salmon with rocket, new potatoes, pimento, basil and olive relish served in the restaurant. Eat Wild opened its 30-seater restaurant in Cirencester last year and since then has gone from strength to strength. It is run by Gloucestershire born brothers and has a vision to bring sustainably sources wild meat and game to the public. A recent review in Country Life Magazine wrote, “Eat Wild is just superb….Seasonal, sustainable and locally sourced, it doesn’t get much better than this. Hobbs House Bakery was established in the Cotswolds in the 1920s and is a true family business who are now bringing up the sixth generation of aspiring bakers. They have four shops across the Cotswolds in Cirencester, Tetbury, Chipping Sodbury and Nailsworth. Their award winning bread is the common feature with an array of loaves available. While you will be unable to resist the smell of freshly baked bread, your eye will also be caught by the amazing display of cakes, buns and patisserie all shouting to be eaten. As one visitor wrote, "a trip to a Hobbs House shop is an unmissable pleasure." Why not call into one of their bakeries and taste for yourself…make sure you buy enough – it won't last for long!